Home inspection finds Power Strip On A Wet Copper Line. 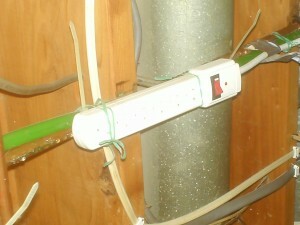 During a recent home inspection I came across a power strip that was being used as permanent wiring. The power strip was twist tied and duct taped to a water line supplying an external hose faucet. The home owner was watering the lawn that day, the Air Conditioning was off and it was moderately humid. As you can see from the picture, the water line was dripping with condensation. Of course, it was recommended that this power strip be removed from the copper water line, and to insulate the exterior water lines to eliminate the condensation when watering the lawn.